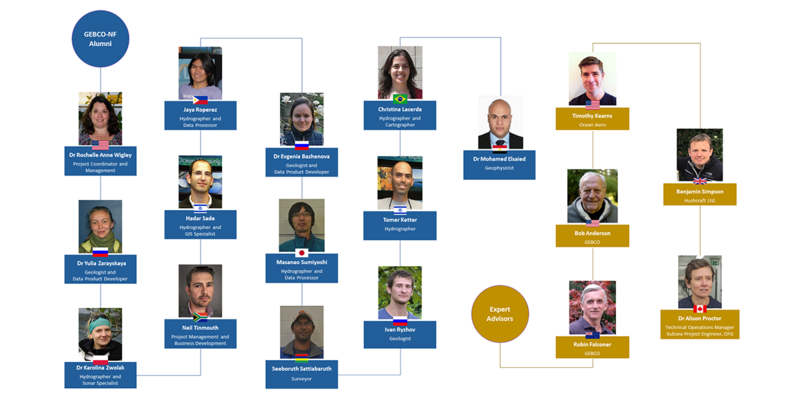 The GEBCO-NF Alumni Team is an international team of volunteers composed led by alumni of the Nippon Foundation / GEBCO Ocean Mapping training program at the Center for Coastal and Ocean Mapping of University of New Hampshire and includes selected GEBCO and industry industry-expert partners. The training program has been running since 2004 and there are currently 72 alumni from 33 different countries. The alumni are working with mentors, advisors and contributors from appropriate industry, research and government organizations worldwide. The Team is characterized by its diversity, from its global distribution, to diverse backgrounds ranging from ocean mapping, hydrography, geology, engineering, boat design, software development, physics and computer science that includes representatives of academic institutions, industry and national hydrographic offices. Our Team approach to the Ocean Discovery challenge is that all the required technology elements e.g. multibeam sonar, underwater navigation, autonomous undersea vehicles, unmanned surface vessels, data transfer systems, remote control systems, and data processing are currently available. 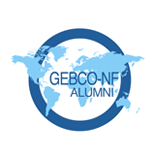 The aim of the GEBCO-NF Alumni Team is to leverage existing technology, wherever possible, and to integrate it to achieve the competition requirements. Our strategic approach is to augment the hardware, integration and software needs of the Team by developing strong partnerships with technology and service providers. It is the interface between the technologies and the all-inclusive manner in how they work together that makes our solution unique, transformative and innovative. Building a coherent team, with members spread around the world, is a human resource challenge comparable to the technical challenge. We look forward to it. The technology plan for the Team includes three core fundamental components. Each of these components may not initially appear transformative for autonomous ocean floor mapping. However, when used in conjunction with each other, and with some strategic innovations, a unique solution emerges that uses proven approaches for bathymetric surveying. It is the interface between the technologies, the newly designed innovative surface vessel and the holistic manner in how they all work together that makes this solution not only unique and transformative, but commercially viable and serving the needs of ocean industries. The AUV-USV concept was conceived as a means to autonomously map the seafloor for longer time periods and over trans-ocean ranges in a wide variety of ocean environments. The AUV-USV concept will lead to more efficient, safer and cost-effective seafloor mapping operations. Dr. Rochelle Wigley received her PhD in Geological Sciences in 2005, where her studies focused on sediment chemistry for marine sequence stratigraphic studies of condensed sediment records. She is currently Project Director for all Nippon Foundation / GEBCO projects at the University of New Hampshire, including the Training Program and the Indian Ocean Bathymetric Compilation project.